”To collaborate with Develandoo means for me diving into the AI world but from a different perspective,” says Abdallah Harati, who has recently joined our strong team of advisors. We are excited to see how our advisory board is gradually expanding by involving new professionals and strengthening our strategic steps dedicated to success. Abdallah Harati has joined us as an International telecommunications solutions’ advisor and board member. He has deep experience and a successful career in telecommunications, having worked in prominent companies like Nokia Corporation (former senior executive). He has a strong belief that his network of companies and contacts in the Telecom and IT world will heavily benefit pursuing Develandoo’s mission. ‘’Today, we have many companies doing fantastic stuff with AI, but very few of them are able to translate to what human beings really understand and need. That’s what I call use case. A realistic use case. Develandoo counts with a very interesting portfolio of use cases based on AI and all being developed based on real customers, or I even prefer to call human being needs. And that makes a difference. To be part of this mission is an honor and I’m truly enthusiastic about it,’’ says Harati. For him, leveraging the networks of contacts and companies is an art, and the ability to match customer pains, navigate through large corporations, make Develandoo’s offer fit into company process, and create meaningful propositions are elements he believes he will be able to assist with. ‘’The world is becoming a smaller place with easier connections compared to a few years ago. Being a truly global citizen, living in more than 10 countries and 4 continents, the goal is to take Develandoo to a much larger scale, from a product offer perspective. 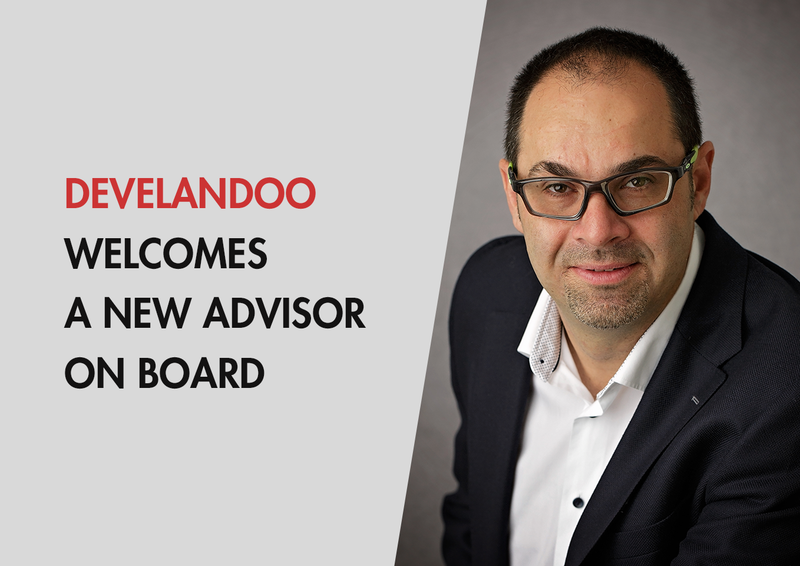 With the experience built in Telecom, IT, IoT and Telematics, I have seen lots of unaddressed pains, which can be resolved with Develandoo’s technology,’’ says Develandoo’s new advisor. Creativity! That’s what Harati expects from this collaboration. He is sure his extreme customer orientation keeps his feet on the ground, ensuring the industrialization of Develandoo’s AI product offerings in a way that is accessible to different corporations, making sure they understand its benefits. ‘’We very commonly use the term “out of the box”, nevertheless, very seldom we manage to really apply in practical terms. Due to my very different background, from large and small corporations, intrapreneur & entrepreneur engagements and believe me or not, art-related activities (as I’m an active musician), I enjoy challenging orthodox patterns and absolutely benefit from the diversity background I carry in my DNA.’’ comments Harati. It’s an honor for the Develandoo team to welcome Abdallah Harati to our Advisory board, wishing us good luck in this promising collaboration.